I confess: I found out the hard way just how important characterization is. I wasted the first third of my Writer’s Journey as I went my merry way manipulating my characters. Plot derives from character? What character-plot connection? My manuscript was the exception! I was One Happy Puppeteer, pulling my characters’ strings non-stop. I was also One Unhappy Wannabe Author. Like April, I was fortunate to have some mighty wise teachers who set me straight. For example, Barbara Lucas, the former Harcourt Brace Jovanovich children’s book publisher, who helped open my eyes to what I wasn’t doing. 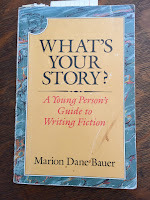 Editor Melanie Kroupa illuminated Barbara’s insight a few years later, turning back two of my revisions of the aforementioned novel, but sharing a Nugget that furthered my understanding of how to craft a character. By the time I was ready to revise my HOWIE – finally under contract - for Mary Cash at Holiday House many years later, I was a whole lot smarter. Bobbi speaks the truth: we do need to know our character’s heart. April does too: we need to know our character’s flaws. And so does Carla: we need to know the facts of their lives. JoAnn’s questionnaire helps reveal all three. 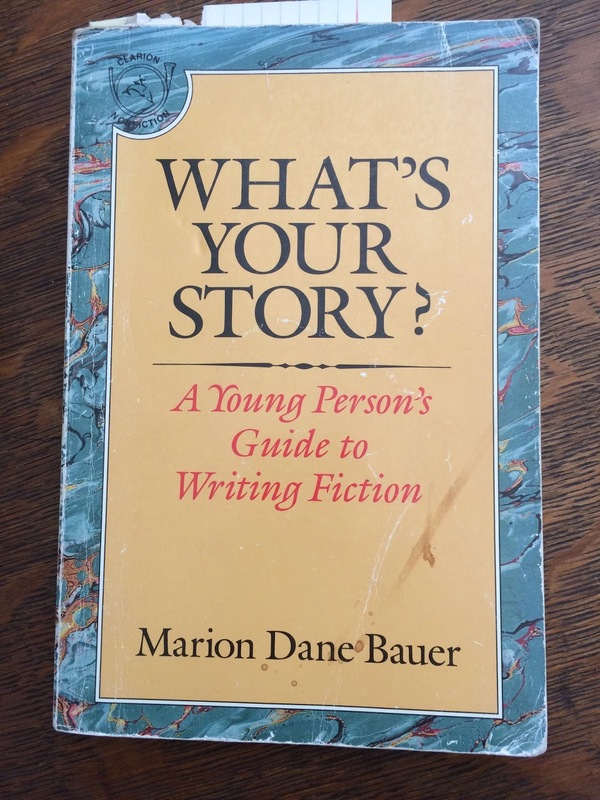 WHAT’S YOUR STORY?, sadly out of print now, then next in an all-day seminar. Marian taught me: a writer needs to know and put his heart, his flaws, his facts - in other words, his story, into the story he’s telling in order for that story to resound in a reader’s heart. We need to find pieces of ourselves to share with our characters. Just look how worn my copy of WHAT’S YOUR STORY? is! Thanks to Marian, those eyes Barbara Lucas opened years before have stayed open. Here’s just one example of how I put Barbara Lucas’, Melanie Kroupa’s and Marian Dane Bauer’s wise words to work. The situation: time was running out; Mary Cash had turned back two of my revisions; I needed an accepted revision to receive the final payment of my Holiday House advance; I needed to connect to my HOWIE! I focused on Melanie Kroupa’s advice. To learn just WHO Howie is and what got him into Trouble, I had Howie create a Name Poem – one of my favorite character exercises, and he included it in the book he was writing. Howie proved to be TOO everything all right – too hopeful, too original, too willing, too intelligent, too enthusiastic. Predictably, his lawn-care business was going down the tubes. A few of his uber traits, though, could/would/should surely save his business, his classmates’ businesses and the business contest sponsor’s reputation, not to mention, the day. Except, where was I in Howie’s story so I could craft him in a true-blue BELIEVABLE organic way that allowed him to solve his dilemma? I needed to connect with him at his crucial “OH, NO!” moment. So I created my name poem. This exercise took me close, but no cigar – as in, revision acceptance and paid-in-full advance. I needed to know WHY he needed to win the H. Marion Muckley Junor Businessperson of the Year Contest. Or else. Howie’s answer forged an immediate heart-to-heart connection with mine. Suddenly, I knew what Howie was feeling. I knew what was at stake. He wanted to matter. That knowledge allowed me to craft a character who not only lived on the page, fully-realized. He could best of all live in readers' hearts. Here’s hoping sharing the above confession helps you craft characters who can do the same! This i super advice. I am about to redraft a PB that wants to become a chapter book and I am relearning all about my characters now. Great exercises to know characters' heart. And congrats on the book. So glad you can learn from my mistakes.....and how - I - learned to correct them, Kathy! You Can Sit on my Poem in NC!